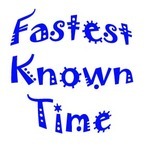 I am planning a FKT attempt and found this: fastestknowntime.proboards.com/post/271 Which reads: "Don't forget, the unofficial or official rules say you must stay on the ground through the duration of a record attempt. Hans flew from Lone Pine to Mt. Shasta. Jack McBroom did the 10 hour drive in an old 4x4 Toyota "four banger" pick-up. "-Paul McGuffin. Believe me this is not my first choice when it comes to styles, in fact the FKT I will be going for I already hold the unsupported record for, but back to the point. In 2007 I set out to cycle the longest road in the world as fast as I could, unsupported. I contacted Guinness Book of World Records to announce this and was told that there is no supported/unsupported record only the fastest time. As someone who puts a lot of emphasis on style I had to argue that the two styles are so different that there deserves to be two separate categories. The gentleman on the other end of the phone calmly explained that "by not separating different styles and placing them into their own category they are able to create a competitiveness that requires people to be constantly thinking of new ways to do things faster or bigger or whatever it is you are trying to do and we want to encourage creativity and thinking outside the box." At first this was hard to come to terms with because it was not what I wanted to hear and it made my attempt seem like bad one when I felt like the style alone should make it a better one (yes I know, but I am a purist). First of all, is this actually a rule? And second how frowned upon is this for a "fully supported" trip/why is one engine worse than another? I don't know who would have made up that rule for the CA 14ers, or why that person would call it "unofficial or official". You would want to research the FKT on that and see what people have done & what kind of standards are in place. I feel that if there is a tradition on a particular route, or an accepted set of practices for a particular challenge, you want to adhere to that unless you have a very good reason that you can defend. For example, it has become accepted practice for the thru-hiker style FKT on the PCT to be done with walking the resupply stops - no thumbing into town. This is a more strict ethic than what would typically be considered standard thru-hiker style, but if you're going for the thru-hiker FKT on the PCT you should follow this style. Another example is the "3000 foot rule" on the CO 14ers - a kind of dumb and arbitrary rule that everyone adheres to. I'd note that aircraft have certainly been used for FKTs, such as the fastest time for every state highpoint (or State & Territory highpoint in Australia).